Correct in all respects. It is particularly ironic when the "recent member" had as one of his first posts details about his trip to John Bonham's grave, together with photographs and detailed instructions on how to get there. Strange stalkerish behaviour considering he probably didn't know the deceased. Here's a thought: Jimmy has been heading to a lot of gigs recently, more than ever before. He's been meeting up with people backstage, could he be asking people to collaborate with him on his album? Highly unlikely. There's no way he'll ever record or perform with a tribute band - least of all Lez Zeppelin - and it's beyond a long shot to think he and Coverdale will ever record together again. Journey? No. The Stone Roses? No. Bic Runga? No, but wouldn't it be lovely if he did! Can't see him not doing a duet with Coverdale again if it arose. No one thought him and Robert would partner on "The Only One". Agreed on the tribute band part. The Stone Roses and Jimmy Page on one album would be beautiful. Donovan asked Jimmy on relatively short notice if he wouldn't mind joining him onstage; there was never any intention for them to record new material. He's had ample opportunity to jam with Coverdale through the years yet never has. The Only One was done as a favor in return for the three hour session he did putting solos on Heaven Knows & Tall Cool One in '87. The same Pete Townshend who bailed out of the 02 event? No chance. Anyway, this thread is completely derailed now. 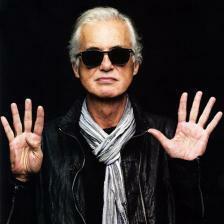 Jimmy Page bailed out of some concert in the early 2000s because he didn't want to open for The Who. In return, Townshend bailed out of the O2 concert because he didn't want to open for Zeppelin. And this video is kinda ridiculous. Well when Coverdale gets off tour if they see fit to get together then great, I'm sure the creation of that song was more than just a favour. 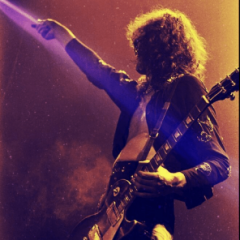 Jimmy Page bailed out of some concert in the early 2000s because he didn't want to open for The Who. False! The Who & The Black Crowes with Jimmy Page launched a co-headlining tour in 2000, with the bands alternating whom would open from date to date. The tour was arranged by Bill Curbishley, who was managing The Who and Jimmy Page at the time. Several weeks of dates were completed...the dates that were cancelled were on account of Page's back injury. According to Robert Plant it was merely a favor he was glad to return, hence the title he gave to it: The Only One. Then the whole meaning of that song has changed for me. I think this is false. Four concerts were scheduled to be played at Madison Square Garden back in 2000. 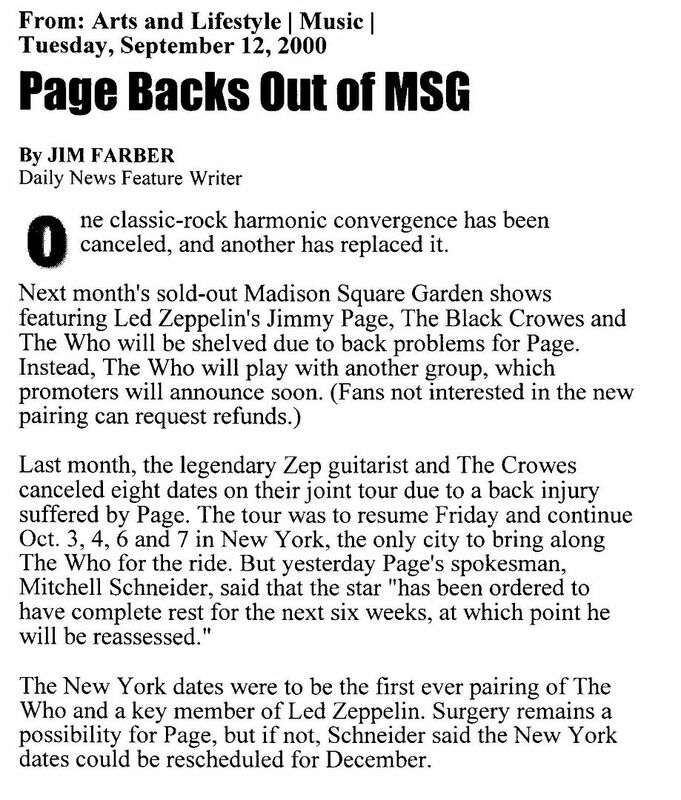 Jimmy Page and the Black Crowes were supposed to be followed by The Who. Then there was a press release claiming that nobody would be admitted into the arena after the Crowes had already started playing. When it was made clear that this was impossible, Page dropped out on account of a back injury. I think it's more than obvious that he didn't want to appear like a second-tier artist playing to a slowly filling-arena with the audience more eager to see The Who with their original lineup. But keith died in 78... how was that the original line up? Just to clarify my earlier post, The Black Crowes and The Who were alternating which band would perform first in each city of the tour, but they were not scheduled to perform together at the same venue on the same night until the MSG dates. Having said that, the insurance underwriters for the (cancelled) tour ultimately insisted Jimmy not perform for at least six months following the injury as a condition of the settlement. This meant Jimmy could not have performed in October 2000 under any circumstances even if he had wanted to. Aside from that, he was still undergoing physical therapy. In fact, his next public performance was not until I saw him play in Montreux, Switzerland on July 7, 2001. Sorry. I meant Townshend + Daltrey + Entwistle. Jimmy was a backstage guest at The Who's end-of-tour charity concert to benefit the Teenage Cancer Trust held at Royal Albert Hall in London on November 27, 2000, further suggesting there were no hard feelings over the previous month's MSG cancellations. Steve, thanks for this info. I obviously misinterpreted the situtation. Don't take it too literally - he DID do it as a return of favour, but it wasn't a contractual obligation thing, it was as FRIENDS. He was happy to contribute - but the lyrics are rather barbed. There's not much chance of spotting him outside of London. If the alternative is that you and Geezer will continue killing this thread then please do.